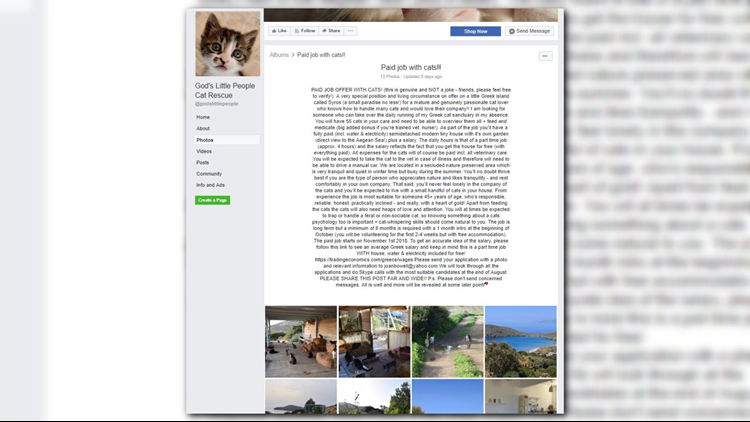 God's Little People Cat Rescue in Syros, Greece is looking for a caretaker for when the owner needs to be away. Do you love cats and are in need of a job? Then this post is for you. The rescue currently houses 55 cats. The approved candidate will need to feed the cats, provide medication and, of course, lots of love. If you're selected, your room and board will be taken care of and you will also receive a salary. The job is long-term.. with a minimum of six-months stay. The owner says in a Facebook post the ideal candidate should be "someone 45+ years of age, who’s responsible, reliable, honest, practically inclined - and really, with a heart of gold! Apart from feeding the cats the cats will also need heaps of love and attention. You will at times be expected to trap or handle a feral or non-sociable cat, so knowing something about a cats psychology too is important + cat-whispering skills should come natural to you." Check out the rescue's Facebook page for photos and other requirements to apply.